What is a PDA Screen Protector? A PDA screen protector is a thin piece of material, such as plastic film or mylar, that is meant to cover the screen of a PDA, or personal digital assistant, to protect it from damage. 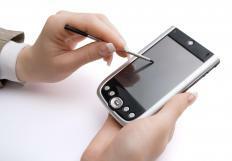 Due to the use of a PDA screen and its interactive, touch-sensitive properties, the screen can sustain damage. The PDA screen protector is meant to protect that investment, as the screen can be an expensive component to replace. While a PDA screen protector can come in a number of different materials, whatever material used must be durable enough to take constant scratching from the stylus, yet be flexible. Finding a material that can be flexible enough to respond to the touch of the stylus, yet tough enough not to scratch can be a problem. However, there are a number of screen guards that can do just that. There are two main types of PDA screen protectors. Some may work by using an adhesive that sticks directly onto the screen. Others may work by simply sliding the protector under sides of the case and over the screen. Each has some advantages. Those who decide they want a PDA screen protector with an adhesive will find that it stays on very well. However, there could be some problems with the application. If there is any dust in the air at the time of installation, it could be trapped on the adhesive. Also, some report they have trouble getting the air bubbles out of adhesive protectors. This can not only create a bad look, but also affect the function of the PDA. The other type of of PDA screen protector is flexible enough to be bent so that it fits under the sides of a PDA. However, this may not be a practical option for everyone because some screens do not have casings that are elevated above the screen or there may not be much room between that casing and the screen. Therefore, it is important to make what any PDA screen protector being considered is compatible with the device for which it is intended to be used. Sometimes, a PDA screen protector may also be referred to as an LCD screen protector, though this terminology could also apply to certain computer screens, especially those used for notebook computers. They can usually be bought wherever cell phone accessories or PDA accessories are sold. In most cases, PDA screen protectors will come several to a pack, though with normal use it may be possible that you will only need one. How Do I Choose the Best TV Screen Protector? What Is a Mirror Screen Protector? How Do I Choose the Best Notebook Screen Protector? How Do I Choose the Best Monitor Screen Protector? What Is an Anti-Glare Screen Protector? What is a Touch Screen Computer? What is a 3G PDA?